Several years ago, I wrote about the enigmatic fossils found in Ediacaran rock. Most scientists think such rocks are 635-540 million years old, and the fossils found in them have been the source of much controversy. Some paleontologists think they were “primitive” animals, some think they were lichens, some think they were fungi, some think they were giant protozoa, and some think that many of them aren’t even fossils. 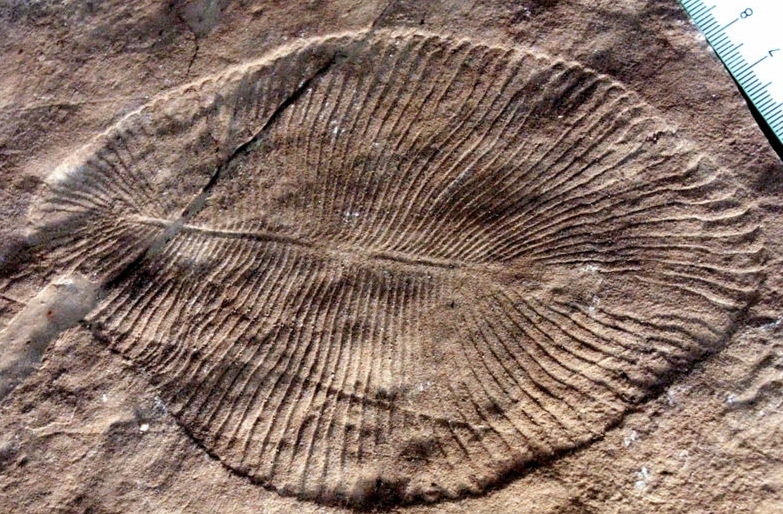 Well, based on some recent research, one Ediacaran fossil (Dickinsonia – an example is shown above) was most likely an animal. The research was done by a team of scientists from Australia, Russia, and Germany. They collected Dickinsonia fossils from Ediacaran rock found on a cliff near the White Sea in Russia. This rock is thought to be 558 million years old. They found a thin layer of organic film on top of the fossils, and they chemically analyzed that film. They found cholestane, which is a chemical remnant of cholesterol. It is important to note that they didn’t find cholesterol itself. They found a decay product that indicates the one-time presence of cholesterol. Why is this important? Cholesterol is a common component of animal cells, but significant amounts of it are not found in lichen, protozoa, or fungi. Thus, the one-time presence of cholesterol indicates that these fossils were animals. But couldn’t the cholestane be contamination? That’s a possibility, so the researchers chemically analyzed the rocks surrounding the fossils. In those rocks, they found little cholestane. Instead, they found the remnants of steroids that are commonly found in algae. So the cholestane is definitely associated with the fossils themselves and is probably not the result of contamination. If a large number of the Ediacaran fossils end up being classified as animals, I think that will add to the long, long list of problems with flagellate-to-philosopher evolution. Since these fossils are supposed to have come before the better-known fossils found in the Cambrian, they would represent either the animal ancestors of the Cambrian organisms or some evolutionary offshoot that came from those animal ancestors. Either way, evolutionists are now faced with the task of trying to figure out some fairly close evolutionary relationship between the Ediacaran organisms and the Cambrian organisms. Given that these two sets of fossils are so radically different from one another, I suspect that will be a daunting task! Any unsuspecting student reading those words would think that we know that a mass extinction of dinosaurs occurred 66 million years ago, that it was definitely cause by a meteor impact, and that there have been other mass extinction events as well. The problem, of course, is that definitive statements like the ones above come from interpretations of the fossil record. The fossil record itself is spotty at best, and the interpretations are based on all sorts of unverifiable assumptions. So the obvious question becomes, “How accurate are those interpretations?” That’s awfully hard to test, since we can’t go back in time and confirm them. However, the great thing about science is that original thinkers can come along and figure out ingenious ways to test what you might think is untestable. A team of researchers from the Florida Museum of Natural History, the University of Bologna, the University of the Bahamas, and the State University of New York at Geneseo decided to test how well we know things like the mass extinction events discussed in the textbook I just quoted. They took a series of geological samples from the Po Plain in Italy that are supposed to represent what went on over the past 126,000 years. They specifically examined the mollusks in those samples, which leave behind hard shells. I was teaching one of my online biology courses yesterday and discussed something virtually every biology student learns: classifying organisms as producers (who make their own food), consumers (who eat other organisms for food), or decomposers (who decompose dead organisms for food). I then mentioned that consumers can be further classified as herbivores (eating only plants), carnivores (eating only animals), or omnivores (eating both plants and animals). I then asked the students how they would classify an alligator. Of course, they classified alligators as carnivores. I then showed them the picture above. 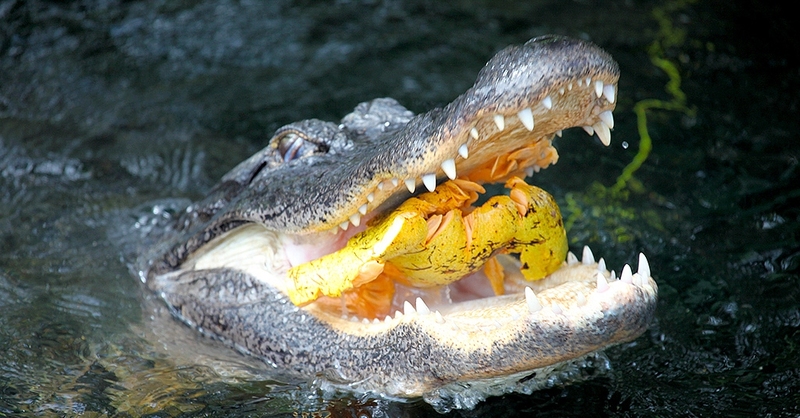 That alligator is eating a fruit (a pond apple) on purpose. It has long been known that alligators and crocodiles ingest plant material, but it was originally thought to be accidental. Perhaps the alligator was biting for a fish, missed, and took in some plant material that was floating in the water. However, recent research shows that in most species, the ingestion is probably not by accident. It is a part of the dietary strategy. After class, I was looking at the scientific literature and ran across an incredible report about a similar phenomenon in bonnethead sharks. Once again, it has been well known that these sharks ingest seagrass, but it was thought to be accidental. Furthermore, since a carnivore’s digestive system is tuned towards breaking down meat, it was thought that the sharks gained no nutrition from the accidentally-ingested grass. We now know that this is definitely not the case. We show that a coastal shark is digesting seagrass with at least moderate efficiency, which has ecological implications due to the stabilizing role of omnivory and nutrient transport within fragile seagrass ecosystems. If sharks and alligators can eat and digest plant matter, probably all animals we think of as carnivores are at least capable of eating and digesting plant material. Combine that with the fact that animals thought to be strict herbivores have been found deliberately eating other animals, and we come to the strong possibility that all animals are really omnivores. Of course, one “take home” message from all this is that creation is marvelously complex, and our attempts to categorize it are incomplete, at best. However, it also has implications when it comes to the issue of origins. Most young-earth creationists (including myself) think that before the Fall, all animals were herbivores. We also believe in a global Flood, where Noah and his family had to care for different kinds of animals on the ark for a bit more than a year. Some of those animals were carnivores, but they could not have been fed other animals (except perhaps some sea creatures from time to time). Creationists critics often say both situations are impossible, because some carnivores must eat meat, or they will die. If a species of shark can gain weight on a diet of mostly plants, it is at least conceivable that prior to the Fall and for a year on the ark, the animals that gave rise to the “carnivores” we see today could have lived on a diet of only plants. Dr. Peter Atkins is a legend in the chemistry community. He retired from his professorship at Oxford University in 2007, but not after receiving such distinguished awards as the Royal Society of Chemistry’s Meldola Medal and the American Chemical Society’s James T. Grady-James H. Stack Award for Interpreting Chemistry for the Public. In addition to his publications in the scientific literature, he has written several excellent books. When I taught physical chemistry at Ball State University, I used his Physical Chemistry as my text. The chemistry community owes him a great deal. Anyone with a modicum of philosophical knowledge understands how wrong such a statement is, but if you like, you can read this excellent piece written by a serious thinker, Martin Cothran. It shows the folly of Dr. Atkins’s thinking in stark intellectual terms. While I don’t pretend to be as smart as Dr. Atkins or Mr. Cothran, I would like to add something to the discussion. When I first read Atkins’s piece, I noticed two huge assumptions that the good doctor makes. It’s clear that he either doesn’t know or doesn’t care that he is making them. Either way, that’s bad. 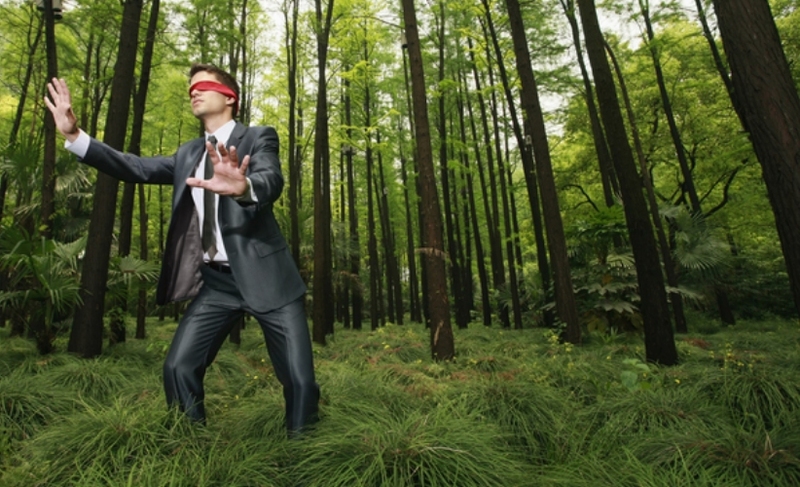 Scientists have to recognize and admit the assumptions they are making, or they are like blindfolded men trying to make sense of their surroundings. Microscope image showing the tunnels that exist between a mouse’s skull and its brain. The human body is truly incredible. It has been so intricately designed that we are still discovering new things inside it, despite the fact that scientists have been studying it in detail for nearly 2,000 years! Just a few months ago, I wrote about the discovery of a previously undetected feature of the human body, and just this month, a team of medical scientists from Massachusetts General Hospital, Harvard University, and Dongguk University (South Korea) have discovered something else: channels that connect the skull directly to the brain! The authors made this discovery while they were investigating how certain immune responses work in the brains of mice. White blood cells, the cells of the immune system, are produced in bone marrow, a soft tissue found inside some bones. The authors developed a technique to identify white blood cells produced in a leg bone (the tibia) of a mouse and distinguish them from white blood cells produced in the skull of a mouse. They induced a stroke in the mouse to activate the immune response and studied what happened. As expected, white blood cells were sent to the brain, but unexpectedly, most of them came from the skull. Why was that unexpected? It has always been thought that white blood cells must travel through the circulatory system to get to the brain. As a result, it was assumed that any white blood cells found in the brain should come equally from all parts of the body. The fact that most of the white blood cells came from the skull indicated that there must be some “shortcut” between the brain and the skull, so the researchers used microscopes to look at the inside of the skull and the surface layers of the brain. What they found is shown in the image above. The darkest splotches in the image are bone from the skull. The skull’s bone marrow is labelled in the figure, as is the top layer of brain tissue (labelled “Brain membrane”). Notice that there are “Channels” which connect the skull’s bone marrow directly to the brain membrane. That’s the shortcut the white blood cells took. They traveled directly from the skull’s bone marrow to the brain, making the immune response more rapid than if the white blood cells had to travel through the circulatory system. Even though the discovery of these “brain channels” was made in mice, the authors examined skull tissue removed from patients who had been through a neurosurgical procedure. They found similar channels that were roughly five times as large as the ones they saw in the mice. Of course, they couldn’t do similar experiments on people, so they don’t know for certain that the channels serve the same purpose in humans as they do in mice. However, it makes sense that they should. The human body is so fearfully and wonderfully made (Psalm 139:14), I am sure this isn’t the last new feature to be discovered! It’s the beginning of another another academic year. In addition to teaching online courses, I am once again teaching Thermodynamics at Anderson University. I love teaching thermodynamics, because it is a difficult subject, but it explains so much about creation. Unfortunately, many scientists and even some engineers (like Bill Nye) don’t understand it. I hope that my students walk away with a solid grasp of the subject. 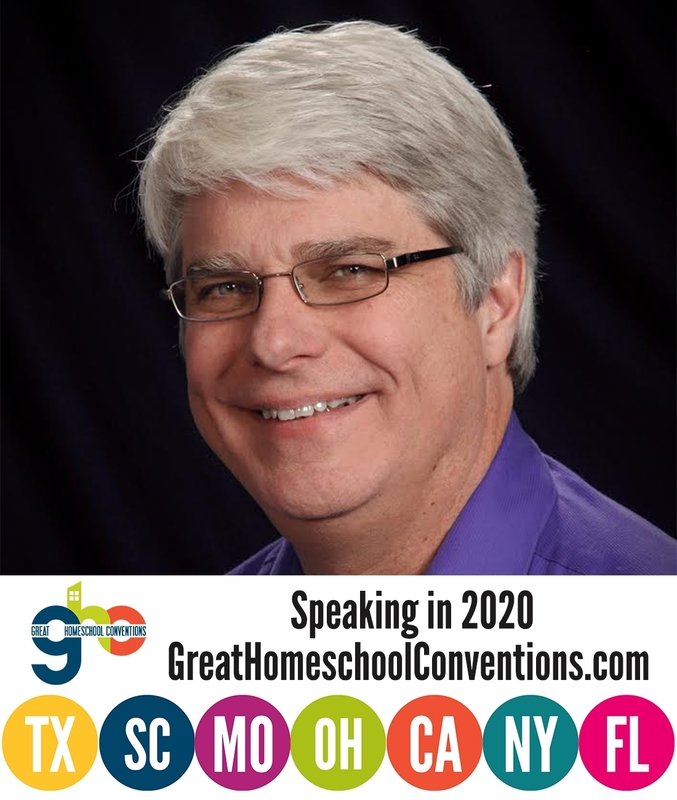 Of course, teaching at the university on top of my online courses will make me a lot busier than I should be, so I am not sure how much time I will have for blogging. I will try to write at least once a week, but we will see how that goes. For now, I hope that you enjoy this video, which is the demonstration I did for the first day of class. A variation of the first part of the demo (the aluminum foil heat engine) is in the last book of my elementary science series, Science in the Industrial Age. Students make the engine when they learn about Sadi Carnot, the father of thermodynamics. Since STEVE events happen where auroras are found, it is reasonable to think that they are related to auroras in some way. However, auroras are visible every night when you are at high latitudes and the viewing conditions are favorable. By contrast, STEVE events are visible only a few days each year, at least according to the photographers who have documented them. 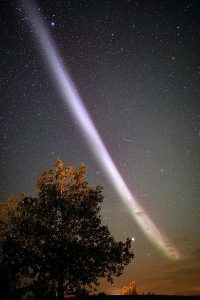 Also, auroras produce a glow that spreads wide throughout the night sky, while STEVE events produce ribbons of light. So what causes these events? Currently, scientists can’t say. The initial study said they might be similar to auroras, which are caused by high-energy charged particles that have been trapped by earth’s magnetic field interacting with molecules in the upper atmosphere. This interaction gives the molecules excess energy, and they emit that energy in the form of visible light, mostly reds, greens, and blues. Scientists looked at satellite imagery that was taken during a documented STEVE event, and they did see charged particles moving at high speeds through the appropriate region of the atmosphere, but they couldn’t say for sure that they were related to the event. Now, some of the authors of that study have published an analysis that indicates STEVE events are not very similar to auroras. They looked at imagery from the National Oceanic and Atmospheric Administration’s polar orbiting satellites that happened to be over a documented STEVE event on March 28, 2008. It was in the perfect position to see if high-energy charged particles were interacting with the upper atmosphere during the event, and it saw none. As a result, there is currently no explanation for what causes STEVE events. I look forward to seeing where the research goes on this! Corals are amazing animals that form reefs which are teeming with life. They eat things that are floating in the water around them, but they also have a mutualistic relationship with algae called “zooxanthellae.” The corals provide the algae with housing, and in exchange, the algae give the corals chemicals they need. It’s a wonderful system that allows both species to flourish. However, there are times when this system breaks down. When corals become “stressed” (usually by a sudden change in temperature, the intensity of sunlight, pollution levels, etc. ), the algae are expelled from the corals. The details of this process are still a mystery, but it usually causes the corals to turn white, as shown in the picture above. Because of that, this process is often called bleaching. Large-scale coral bleaching events, in which reefs become extremely fragile, were virtually unheard-of before the 1980s. That’s the typical “party line” when it comes to those who don’t want to study the issue of global warming seriously. Something bad is happening now, it hardly ever happened in the past, and if we don’t do something about it soon, we are all going to die. Not surprisingly, it just isn’t true. Why do they appear to glow? Well, at twilight, the sun is below the curve of the earth, so you can’t see it directly. However, if you were up higher, you could still see it. Indeed, this video shows a drone observing the sunset at a height of 80 feet and then rising to 400 feet to see the sun set again. So even though you can’t see the sun once it sets, higher altitudes still “see” it. That means the sun’s light is still shining brightly on things that are high in the sky, including the ice crystals. Some of that light scatters off the crystals and heads to the earth. If you are at the right place on the earth and it is dark enough, you can see that light, and it looks like the light is coming from the “clouds” themselves. Here is an excellent time-lapse series that shows both noctilucent clouds and an aurora. Why am I blogging about this phenomenon? Because this year has been an unusually good year for seeing it. Indeed, reports of these “glowing clouds” have tripled this year compared to last year. What’s causing it? According to Dr. Lynn Harvey of Colorado’s Laboratory for Atmospheric and Space Physics, it’s because there is an unusual amount of water in the mesosphere this year. It is also a bit colder than normal. Combine those two effects and you have more ice crystals and therefore more noctilucent clouds. Why is it wetter and colder this year in the mesosphere? We don’t really know. 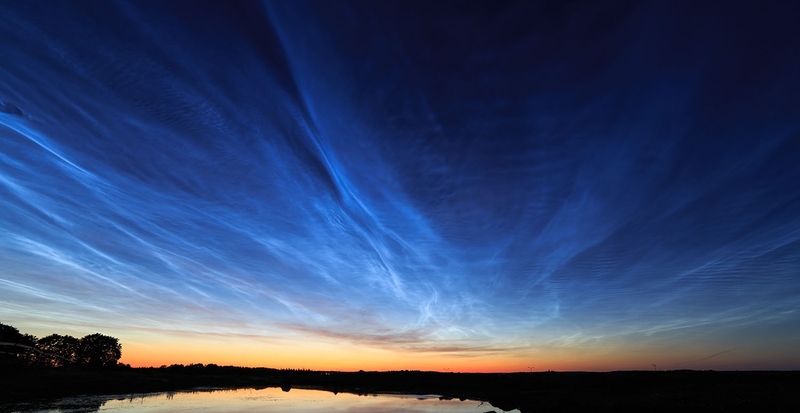 In fact, noctilucent clouds are a bit of a mystery in general, since they were first reported in the summer of 1885. Whether that means they just started forming then or just happened to be noticed then, we don’t know. However, most other striking atmospheric phenomena had been observed much earlier. Auroras, for example, were reported in ancient china and were named by Galileo in 1619. It’s hard to believe that a similar atmospheric phenomenon that can be seen at the same latitudes existed but remained unnoticed until 1885. Of course, unlike auroras, noctilucent clouds are rare and short-lived. After all, they occur only in the summer and, in order to see them, it needs to be pretty dark, since sunlight overwhelms the small amount of light coming from the ice crystals. Thus, the sun has to be below the curve of the earth for the observer. However, once the sun is well below the curve of the earth, it no longer shines on the ice crystals in the mesosphere above the observer. This fact might have made them less likely to be observed and, even when they were observed, less likely to be believed, since they would “disappear” after a while. So it may be that noctilucent clouds clouds are a fairly recent phenomenon caused by human activity, and it may be that whatever human activity is causing them is increasing their frequency. Of course, it may also be a natural phenomenon that ebbs and flows over time. We just don’t know. That’s the great thing about science. There always seem to be more questions than answers! Several animal studies have shown that exposure to blue light can increase the animal’s risk of age-related macular degeneration (AMD) and other eye problems. However, studies on people haven’t been clear. 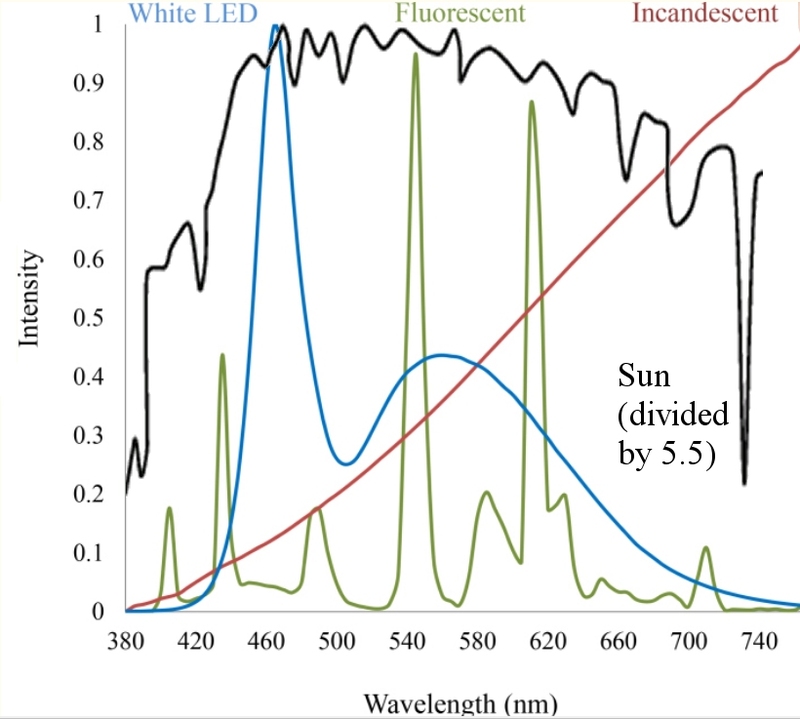 Some studies have shown a relationship between long-term exposure to the sun’s light and AMD, and it is assumed that the blue light given out by the sun is the culprit. However, a case-controlled study in Australia indicated that it might not be exposure to the sun’s light that is causing the relationship. It indicates that sensitivity to glare and difficulty developing a tan are the actual indicators of higher AMD risk, and studies that show a relationship between the sun’s light and AMD might not be controlling properly for those variables. 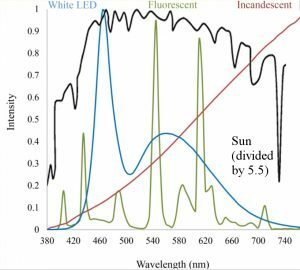 The study that was discussed in the University of Toledo article linked above didn’t assess the damage blue light causes to human eyes. 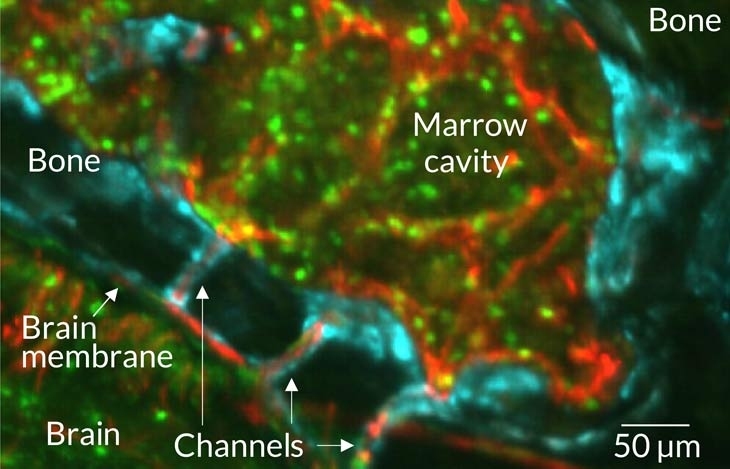 Instead, the authors assessed the damage on human cells. However, they didn’t use actual light-sensing cells from a human eye, because that’s not possible. They used HeLa cells, which are a line of cells that came from cancerous tissue taken from a woman named Henrietta Lacks more than 65 years ago. The cells continue to reproduce to this day, so this line of cells is often referred to as “immortal.” The story behind the acquisition of the cells is the topic of a very sad and interesting book as well as a pretty lousy movie.